There has been a lot in my mailbox according to my husband who is at home in Illinois while I wait for him here in the Northwoods of Wisconsin. I cannot post of the contents yet, I’ll save that for the last week of June, but I will leave a place for you to link up your posts. Meanwhile, I am reading by the lake in this lovely secluded spot. Happy Mailbox Monday! The view is lovely — watch out for ticks though, from someone who contracted Lyme disease 5 years ago. I have fond memories of family vacations in the Wisconsin Northwoods. Enjoy! It can wait. That lake is fantastic. What a sweet calm lovely view. Enjoy! Lovely spot. Have fun and happy reading! I immediately noticed the idyllic setting — very nice! Sounds like you will have lots of fun opening book packages when you return home. Enjoy the peace and quiet of that beautiful spot and make the most of the uninterrupted reading time. Your overflowing mailbox will be a nice surprise when you return home. Thanks for taking the time to put up this week's link. What a lovely view! I hope you are having a relaxing time. We've been going nonstop since we arrived in the Seattle area. No time to read except during our flights. can't wait to share some of the photos. Take care! What a relaxing view, perfect for reading. Hope there are lots of lovely parcels when you get back! What an ideal setting for reading. I can hear the birds singing and the leaves russling gently in the breeze. I hope you got some great books in your mailbox! What a great spot. It looks lovely. Enjoy! Thanks for hosting MM. Wow….what a fabulous, relaxing place to read. What a gorgeous view! Enjoy! What a blissful spot. I'm getting closer to heading up north to UP Michigan to my own spot like that although my parents say the mosquitos are fierce this year so maybe more reading curled up inside for me. I want to be in a place just like the pic! I will HAVE to find a way to get some blissful solitude in this summer! Thanks for hosting! What a beautiful photo. Enjoy the tranquility. Thank you for hosting. Nadia, I just downloaded Edward Rutherfurd's latest release Paris for my Nook. All of the books I've read for Tamara and Bookbath's Paris in July are still so memorable to me, such as The Paris Wife or A Movable Feast, that I love to participate. So glad were in it together!! Have a great getaway! I envy you reading time in such a lovely place. What a lovely reading spot! Enjoy, Bellezza! Thanks for the reviews – just finished The Thief and looking for more. I want to go to that lake! Looks like a perfect place to read, surrounded by the sights and sounds of nature. 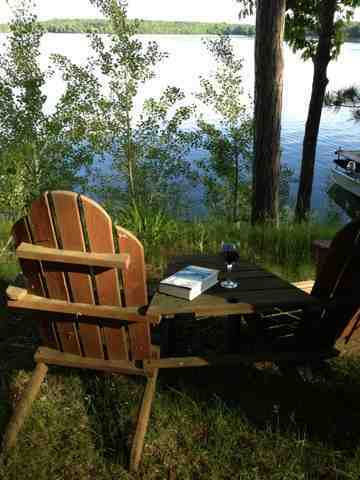 You are reading by the lake – it looks so beautiful! Happy reading! Holy smokes…I just love this photo! I live in Ashland, WI, which is pretty much as North as it gets so I'm curious if you are close to me. My friend has a cabin in Iron River and we spend many lazy weekends floating aimlessly on the pontoon!